Growing in understanding is a grace from God. My Maryknoll Spirituality Year here in Chicago, USA has availed me many opportunities for growth. My understanding of the missionary charism of Maryknoll has also grown. I have learned about the beginnings of Maryknoll. I have also been inspired by the example of James A. Walsh and Thomas Fredrick Price. I have learned too about Mother Molly Rogers, an American woman whose zeal for mission led to the founding of the Maryknoll Sisters of St. Dominic. 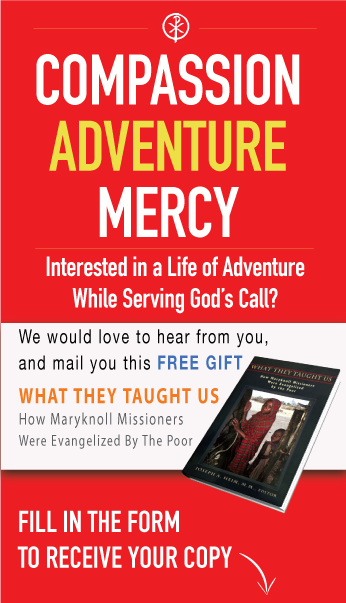 A major aspect of Maryknoll’s missionary spirituality involves flexibility and adaptability. Maryknoll’s history presents men and women who are willing to live side by side with people of other cultures. I cannot help but notice how, relative to the mission lands of my home region, accessing social amenities is easier in the US. This realization is a result of living in the US during my Spirituality Year. For Maryknoll missionaries serving outside of the US, it is evident that adapting to a lack of this comfort is steeped in and informed by a deep desire to expand the Reign of God. Choosing to be a missionary disciple of Jesus demands that we examine our perceptions of comfort. My Spirituality Year has challenged me to consider the comfort of home vis-à-vis the spiritual fruits of living side by side with the marginalized of cultures foreign to my own. I have asked myself frequently: what do I want? ; what do I desire? ; what do I hope to achieve? ; how can I serve God? ; Reflecting on these questions has helped me discover many gifts from God. I have also realized how hard it is to speak definitively about who God is. I do not have a monopoly on the message of Christ. I would do well, therefore, to tread lightly on, as Rodger Schroeder, one of my professors at the Catholic Theological Union (CTU) would say, someone else’s garden. My prayer, during this year, has been that God may purify my intentions to serve as a Maryknoll missionary. I arrived in the United States on February 15, 2017. I have no fond memories of those freezing temperatures that welcomed me to the western hemisphere of the globe. I spent the first three months of my Spirituality year in the Maryknoll Initial Formation House here in Chicago. I was warmly welcomed by the community on my arrival. Many of my needs were anticipated by members of my community. With such a community, understanding the basics of Divine Providence is not difficult. The Intercommunity Novitiate (ICN) program helped me consider aspects of my vocation in the company of novices from other congregations and orders. I enjoyed the company of the novices. Often, I found concepts at the ICN stimulating. My studies at CTU and a tutoring ministry at San Miguel School helped orient me to the people of America. I remember admiring the efficiency that seemed to be almost everywhere: from the public transportation system to procedures at CTU. I spent some months at Maryknoll, New York as part of my formation. I found the veteran missionaries inspiring in many ways. I got to meet some missionaries I’d heard about back at home in Kenya. Meeting with Fr. Art Wille, Fr. Paul Belliveau and many other Maryknoll Missionaries who worked across the globe was both humbling and energizing. It occurred to me that I was in the presence of Maryknoll’s living history. I enjoyed conversations with Maryknollers in the dining hall. Conversing with men who have trod in the footsteps of Jesus in the missions strengthened my desire for service. My intention to serve God wherever I’m sent was confirmed. Attending a mission spirituality seminar with Fr. Larry Lewis, MM helped me to reflect on my experiences at the Knoll. God was gracious to me through the work of Fr. Larry. Events at the Knoll helped me learn about Maryknoll’s way of proceeding. I also met many people who support and contribute to Maryknoll’s mission. Indeed, together we make God’s Reign visible. Francis X. Ford, distilling many years of experience in the missions, counsels that ‘God needs us where we are’. I have witnessed God’s fidelity to me in this land far away from my native one. I have been prepared to serve the people of God in the missions. Through my ministry at the University of Chicago Hospital, I have found Jesus in the people I ministered to. As Ruth Burrows writes in The Essence of Prayer, formation here in Chicago has helped with my ‘attitude of heart and mind…[one]…that remains always on the receiving end in the divine relationship’. I took my First Oath to Maryknoll on December 10, 2017. During the homily, Fr. Raymond Finch, MM spoke of the gravity of my commitment. With my First Oath, I chose to commit myself to Maryknoll. Programs in my Spirituality Year prepared me for this level of commitment. Maryknoll’s mission has held a place in my heart for many years. Now I get to be part of this mission which is itself a gift from God. I choose to learn, to love and to serve God’s people in the Maryknoll way. My desire to be a missionary disciple is confirmed. It is this desire that, as Ita Ford, MM counsels, helps infuse meaning in my life. I do not take this for granted. I’m grateful to my family back at home in Kenya and to members of the Maryknoll Africa region. I leave for Cochabamba, Bolivia, on Wednesday, December 20th, 2017. I am confident that my friends are praying for me. I have their blessings. I have witnessed God’s fidelity through the presence of my friends during my First Oath here in Chicago. I found God in the people who have accompanied me during my Spirituality Year. These souls have been the channels of God’s grace. I felt blessed and joyful on December 10, 2017. Now, I look forward to sharing the gift of joy that God has bestowed upon me in Bolivia. Primum, Regnum Dei.